A defining symbol of Africa, elephants are one of the most unmissable components of a safari. You’re anticipating a big animal. But nothing can prepare you for the first close-up of an elephant. They are much bigger than you’re imagining, towering high over the safari vehicle with resplendent tusks that curl skywards. And they’re as majestic as the imagination can conjure. Even though elephants inhabit thick woodland and dense savannah, a four-tonne mammal can’t really hide. The world’s largest land mammal is incredibly easy to find. If a park has elephants, you’re not going to miss them. Gaze out from the camp and you’ll see them dotted along the horizon. As the sun sets you’ll admire trunks and ears becoming silhouettes in the distance. When you explore forests you can’t miss the bulldozing paths created by elephant herds, the trees felled in all directions. Elephants are widespread across Africa and they’re the easiest of the famous big five to find. These are African elephants, much bigger and more independent than their Asian counterparts. An easy way to distinguish them is the ears; African elephants have large ears shaped like the continent they grace. Forget any notions of riding elephants. The first glimpse of a wild elephant and you’ll realise that these are animals to admire, not conquer. Gaze upon a single elephant and you’ll know you’re in the presence of greatness. When you see one it’s usually a huge old bull cast out from the herd. We can’t get enough of the retired bulls found in Ngorongoro Crater, some of them more than double the size of the safari vehicle. Spotting a herd is even more spectacular, a moving mass of tusks and trunks elegantly crossing the landscape. In some destinations you’re literally surrounded by herds, unable to go more than five minutes without seeing another ten elephants. 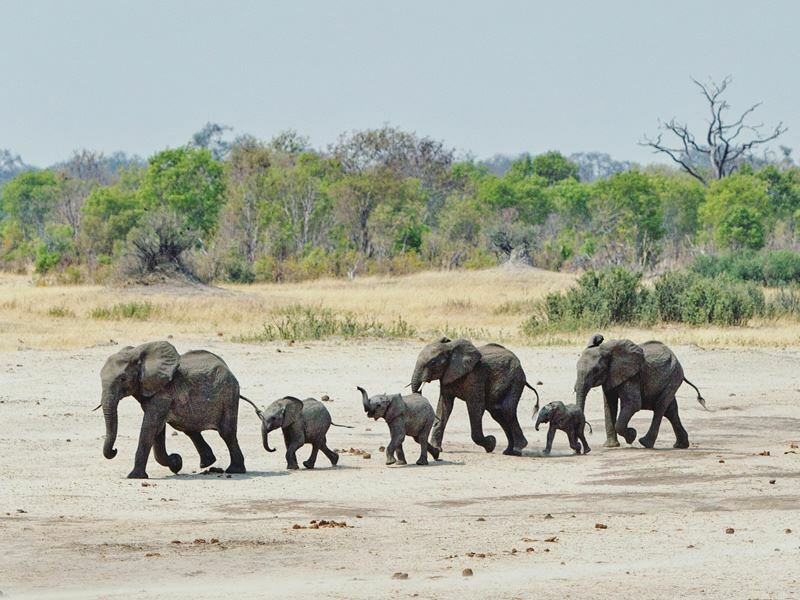 Northern Botswana, Chobe National Park in particular, is home to the world’s largest elephant population. It’s easy to picture what ten elephants might look like. Even a hundred isn’t beyond the realms of the imagination. But try to conceive what 100,000 elephants looks like. It’s unfathomable. They are so plentiful that you’ll see them crossing the national highway, or wandering about in sight of the international border posts from Botswana to Namibia and Zimbabwe. Even after many visits to Chobe, we still can’t comprehend the experience. Not all elephants are the same and those returning to Africa will delight in the contrasts. Tusk size varies dramatically dependent on the habitat and those around southern Zimbabwe and northeastern South Africa are the really big tuskers. Botswana’s Chobe doesn’t just have the most elephants; it has the largest of them all. Tanzania’s Tarangire is also home to huge impressive herds while Addo Elephant National Park is a great option for those on a self drive safari in South Africa. Visit Kenya’s Amboseli and the enduring image is of elephants backdropped by Mount Kilimanjaro, while in Namibia, lone nomadic elephants provide a focal point to the sublime panoramas. Elephants go where they please. Sometimes they pass just a couple of meters from the vehicle, literally putting everyone in the shade. On many occasions we’ve been completely surrounded. We also have many tales of being transfixed by a cheetah or leopard, only to turn around and find we’ve been oblivious to an elephant herd just metres away. Their predictability makes them safe to encounter at such close proximity. When annoyed, elephants will give two warnings, stamping their feet and flapping their ears in a show of power. Sometimes the warning also comes with a loud hoot on their trunk, which is a surprisingly melodic natural trumpet. Good guides will back off and drive away on the first warning. The stories of vehicles getting flipped by elephants come from self driving tourists who kept flashing the camera. Ignore two warnings and the elephant will charge. Elephants are herbivores and they consume an astonishing amount of food. Evidence of their devouring ways scars the landscape and you’ll pass great swathes of uprooted trees and fresh pathways. They’re not that picky over the type of tree so you’ll be encountering elephants all across East and Southern Africa. Zimbabwe’s Mana Pools, Zambia’s South Luangwa, Uganda’s Queen Elizabeth national parks...we can virtually guarantee that you’ll return home with elephant photos, regardless of the country you visit. However, a bountiful collection of food is required to maintain high elephant numbers. National parks and national reserves are the biggest of the safari destinations; almost all them are home to a strong elephant population. Small private reserves don’t have the space, so can only support a handful of elephants. There’s a huge difference in the experience; two elephants locking trunks in a private reserve is a great photo, but appreciating their power and grace really comes when you encounter hundreds on a single game drive. Elephants like the water, especially in the evening. We can recommend a number of camps and lodges that overlook a river or waterhole, so you just need to sit back and watch the show. Trunk-swinging babies chase warthogs; matriarchal herds wait their turn to drink, while upcoming males test their ability to scare off rivals. More intimate experiences come on boat safaris and we love it when the elephants start using their trunks as snorkels. With excellent guides, you may also encounter elephants on a walking or horseback safari. Respect their space and the elephants will pass by without a care in the world. These are peaceful animals; just remember that they’re fully aware of how powerful they are. Perhaps our most favourite elephant moments are those that come from around the campfire. You watch them ramble across the horizon, or wander through the camp on route to the water. It epitomises the immersion of an African safari, a huge tusker gracing the evening when you’re about to tuck into dinner. They even grace the experience long into the night, those trumpeted calls leaving you captivated when drifting off to sleep. For your financial security the air holiday packages shown are ATOL protected by the Civil Aviation Authority. What is your approximate budget per person? Africa Sky and our other brands would like to email you from time to time with our newsletter, holiday offers and information about our products and services. Please tick here if you do not wish to receive these emails. We will process your personal data in line with our Privacy & Cookies Policy. Our other brands include Tropical Sky, American Sky, Canadian Sky, Australian Sky, New Zealand Sky, Just Seychelles.com and Tropical Sky Weddings. Africa Sky and our other brands* would like to email you from time to time with our newsletter, holiday offers and information about our products and services. Please tick here if you do not wish to receive these emails. We will process your personal data in line with our Privacy & Cookies Policy. Our other brands include Tropical Sky, American Sky, Canadian Sky, Australian Sky, New Zealand Sky, Just Seychelles.com and Tropical Sky Weddings.